The plan for this evening was to make some pumpkin and carrot ravioli with some olive oil and garlic tossed Swiss chard. Don’t get too exited, because that’s not the recipe that follows. I failed – miserably – to produce said ravioli. 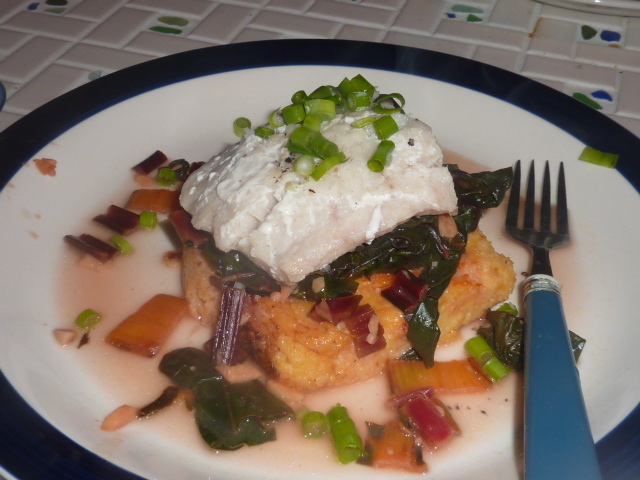 I roasted and pureed the pumpkin and carrots, prepped the Swiss chard, and then we had a bit of a pasta mishap. I got one measly ravioli out of a couple hours of prep. Boooo. Double boo in that the one ravioli (though flawed due to overly thick and gummy dough) was pretty darn delicious, and left me craving more. Following is the recipe I whipped together in order to replace the ravioli. 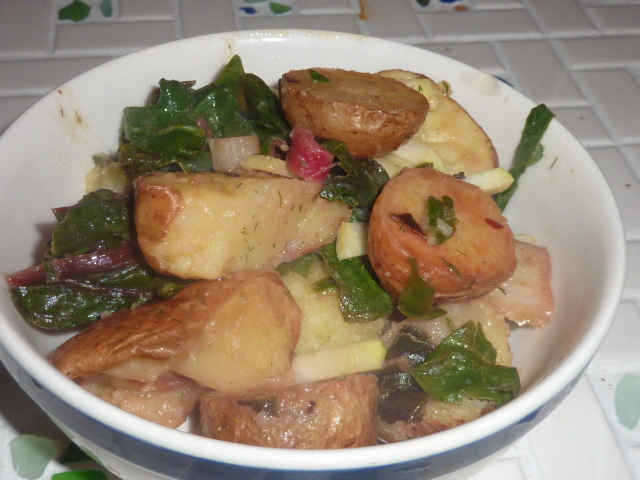 I’m still a little depressed about the mound of food that went straight into the trash, but yummy roasted potatoes combined with some lovely Swiss chard and kohlrabi cheered me up significantly. This dish is incredibly easy to put together and packed with flavor and nutrients, while very low in fat and cholesterol. Cover a baking sheet with tinfoil. Toss potatoes with 2 tbs. olive oil, kosher salt, and crushed red pepper flakes. Roast for 25-35 minutes or until easily pierced with a fork. Meanwhile, toss kohlrabi with lemon juice, kosher salt, and dried dill weed. Set aside. Heat remaining olive oil in a large sauté pan. Add garlic and Swiss chard ribs and sauté until tender, roughly 5 minutes. 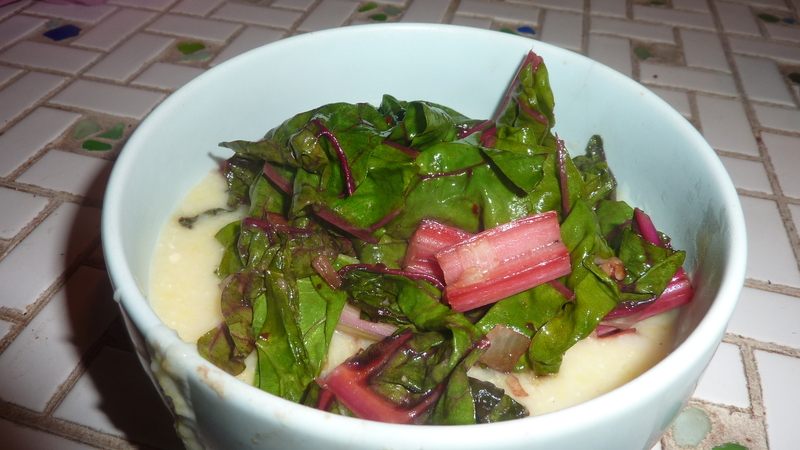 Add Swiss chard greens and sauté until wilted, 3-5 minutes. Add potatoes and white wine vinegar and smash slightly with a wooden spoon. Stir thoroughly to combine and smash potatoes again. Add kohlrabi with lemon juice and toss.